Cushbawn is the 950th highest place in Ireland. Park in the fake village of Macreddin at T12395 82350 A or nearby. Go south about 200m on the road until you come to Macreddin Bridge (not fake and shown on the map). There is a track on the eastern side of the river there with what looks like a Coillte sign inviting you to walk. (The only drawback to this is the risk of being hit by a golf ball.) Go south around 1km on this coming to a junction at T12928 81178 B. There is a sign there for a walk for Sean Linehan (a former Garda in nearby Aughrim). 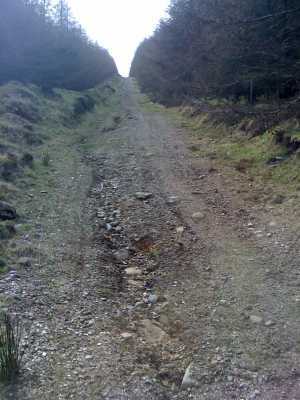 Turn left (north) onto this track which has a narrow gate and is intended for walkers as opposed to a nearly parallel forest road. Navigation to the summit is then easy. Just follow tracks heading NE and gaining height until you reach the summit. Getting back is possible by simply reversing your steps or you can use a series of tracks to emerge from the forest at T128852 C, a route I may describe in more detail as a MV walk. Picture from csd : Summit of Cushbawn, looking east. Picture: Summit of Cushbawn, looking east. Picture from simon3 : Cushbawn from the SE. 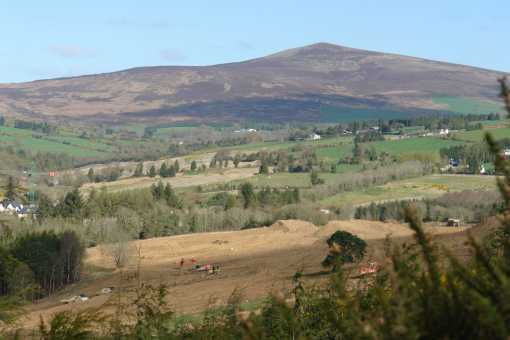 Picture: Cushbawn from the SE.